Visit TEMPTationS from 1 March until 30 April 2017 to enjoy their value added buffets for Lunch or Dinner where you can gobble and guzzle without burning your wallet. Gather your family and friends for Lunch as the buffet is priced at only RM60nett per person while the Dinner Buffet is at RM80nett per person and complimentary car park at the hotel basement. 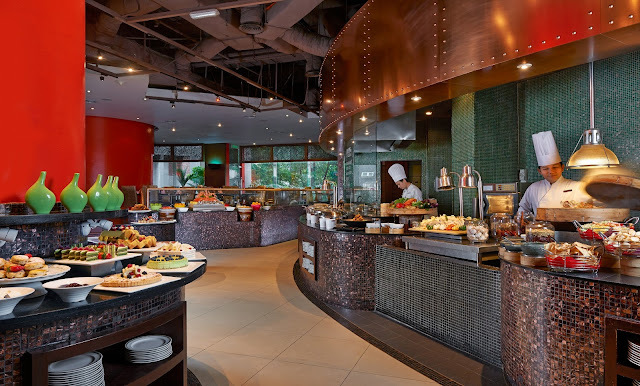 In addition to the reduced buffet prices, diners will be able to complement their meals with 2 hours free flow of house wine at RM66nett per person or 2 hours free flow of soft drinks at RM22nett per person. Executive Chef Helmut Lamberger and his team have crafted special menus on rotation basis tailored to cater to every palate where diners will also be able to savor a tantalizing selection of dishes spanning from East to West. From Soups and Salads to a variety of Seafood on Ice to start off your meal, there is also a hearty selection of homemade breads and cheeses to be relished. Specials at the Dinner Buffet include live stations dishing out Chicken shawarma, Roasted lamb shoulder with rosemary jus, Freshly grilled chicken and beef satay and Salt crusted baked whole seabass to name a few. * Prices are inclusive of 6% Goods & Services Tax (GST). card benefits or other discounts. Just went here last week. Yum yums.. Super love their food choices.